My favorite recipes are the ones that happen by accident. You know, the ones where you throw a bunch of stuff together and out comes an amazing recipe?! Yeah, that’s what happened here. BBQ Chicken Kale Salad for the win! It all started with this beautiful kale. My favorite kind, lacinato (aka dino kale). It’s the least bitter tasting kale, easy to work with and tastes great in a salad or cooked. In this recipe I like chopping it up super small so it’s really easy to eat and every piece gets coated with the dressing. Then comes this easy shredded BBQ chicken that I made in the Instant Pot. If you don’t have an Instant Pot, first of all, why? And second of all, you can use any leftover BBQ chicken or make it in the slow cooker. Finally, top it off with these crispy chickpeas and your life will be changed forever! A little protein, a little crunch and so much flavor. Add some avocado and your favorite ranch dressing for the best salad of your life. Ok, maybe I’m being a little dramatic, but it’s real real good. 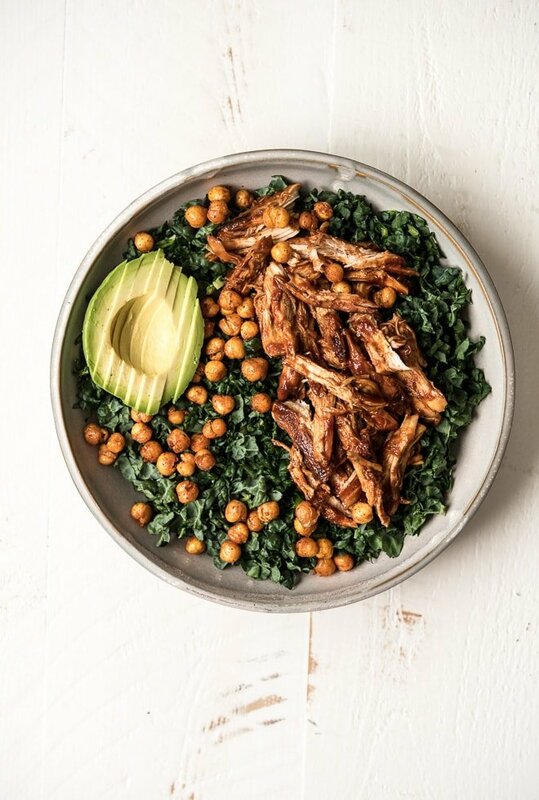 Chopped kale salad with BBQ chicken, crispy chickpeas, avocado and ranch dressing. Place the chicken in the instant pot with 1 cup of the BBQ sauce. Close lid and make sure the valve is on sealing. Cook on manual high pressure for 12 minutes then manually release pressure. Remove chicken and shred with two forks then place back in the Instant Pot and add additional BBQ sauce if desired. Set aside until ready to use. After you rinse and drain the chickpeas, carefully dry them with a paper towel then add them to the lined baking sheet. Toss evenly with olive oil, salt, garlic powder and paprika and bake for 25-35 minutes until crisp. As they cool they will get crispier. Add the chopped kale, chicken, chickpeas and avocado to a large bowl and toss with your favorite ranch dressing, homemade or store bought. Serve immediately and enjoy!